Another big time favorite of kids. We love Mr. 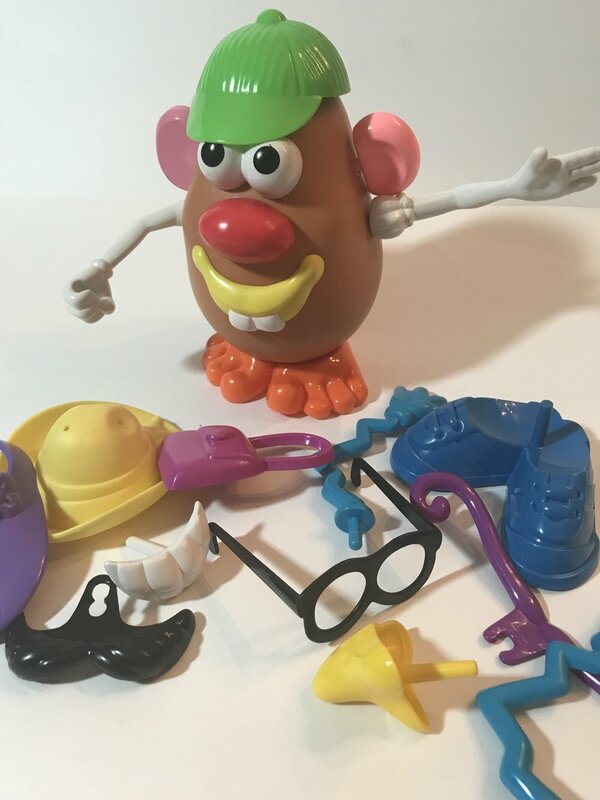 Potato Head for many reasons but especially since he helps our kids work on learning body parts in a fun naturalistic way. Check out our blog on teaching body parts: https://www.kidspeakdallas.com/kidspeakblog/teaching-body-parts Mr. Potato also encourages finger and hand strengthening as well as simple pretend play skills. Mr. Potato Head can pretend to dance, run, whatever his heart desires. They also now make many different versions of Potato Head like a pirate, princess, Santa and even Darth Vader. Too much fun. Now this is a given. Start to read to your child as soon as they are born and don’t stop. Books are full of language and can be a calming joint attention activity between you and your child. Point to the pictures as you talk. Describe the pictures. You don’t always have to read the book word for word. Break it down to your child’s level of understanding and expression. They will naturally learn vocabulary, grammar, rhyming and so much more. You can also base a weekly learning theme around a book which will provide your child even more learning opportunities to develop the language. Check out our blog “The Power of Books”https://www.kidspeakdallas.com/kidspeakblog/the-power-of-books for more tips on how to pick out appropriate books for your child, how to make it a learning experience and a list of a few of our favorite children’s authors. Many of us, like our children, are visual learners, auditory learners or a combination of the two. Sometimes we forget about kinesthetic learning. Little ones LOVE to play on big bouncy balls. Help them bounce on their bottoms, roll on their tummies and even roll it back and forth to mom, dad, brother or sister. You will be surprised at how much language will come out of your child once they are moving. Who doesn’t love building towers and then crashing them down? We love these big chunky light weight blocks for little hands http://www.amazon.com/Melissa-Doug-Deluxe-Cardboard-Blocks/dp/B000A12YBW. They help promote constructive play skills as well as problem solving, joint attention and communication. Make up a “build a tower” song and then knock it down together. Your child will think it’s the greatest thing on Earth! Play-Doh gives your child endless possibilities. First of all, it will provide them with nice sensory input as well as encourage fine motor skills and strengthening. Second, you can work on many different social communicative intentions like asking for help, protesting, commenting, securing attention, directing attention, requesting and engaging in conversations. We like to start out teaching our children to simply manipulate the dough with their hands by squishing, rolling and pushing. Then we like to add in Play-Doh tools like rolling pins and dough scissors. Kids love to use different cookie cutters like letters, numbers, vehicles and animals. Once they have the constructive part of the play down, then you can add in simple symbolic play by having their shapes perform actions and making pretend cookies or pizza. If you are hesitant about Play-Doh due to the messiness factor, try playing outside or have your child wear a smock and put a table cloth on your table and a sheet on the floor for easy clean up. Encourage your child to help with the clean up! A simple fishing game is such a fun way to introduce early game play. We start out helping little ones by putting the fish on the floor and using one fishing pole while taking turns. This structure and sitting in little chairs seems to help too. Kids’ language seems to explode because they love this activity so much. You can work on turn-taking language, calling each others’ names (securing attention), using “look” (directing attention) and the kids love to comment about all the different kinds of fish (color, shape, size, type). The fishing game can be a physically tricky activity so your little one will likely need some help. Give them the hand over hand help that they need and then fade away the assistance as appropriate. We got our fishing game at Lake Shore Learning: http://www.lakeshorelearning.com/product/productDet.jsp?productItemID=1%2C689%2C949%2C371%2C895%2C379&ASSORTMENT%3C%3East_id=1408474395181113&bmUID=1365777827885 . Your child will love this change from crayons and markers. You can work on so much language with water colors: turn-taking language, more, look, calling your name, commenting and conversations. Sometimes water colors can be physically challenging, so give your child hand over hand assistance as needed and then fade away the help. Also the sequencing of the steps can be tricky. Make up a fun song about the steps “water, paint, paper” and sing as you paint. Most kiddos love animals. A toy farm is a great way to introduce early symbolic play skills as well as communication. They will have so much fun learning the farm vocabulary (animal names, eat, drink, sleep, play, run, hungry, thirsty, up, down, etc.) and having the animals pretend. If you are uncertain if your child is ready for any of the above activities, we suggest trying them out with your child to see how they do. Is the activity safe? Is your child attending and engaged? Does your child need some assistance? You know your child the best so just try and see how it goes. We hope you have fun helping your child learn with our top 10 speech and language toys!